You will love having this XLR Micro Boost toy hauler accompany you on all of your next big adventures! Because this unit can sleep six people, you will be able to invite your friends to join you as you tour the countryside, and the walk-through bath will make it convenient to access the tub with its two entry doors on either side. 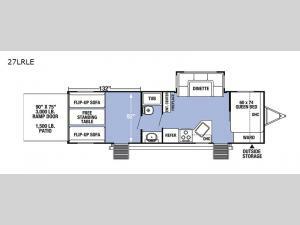 Plus, the exterior portion of this trailer also has two entry doors, and that makes it easy to get to the garage or main living area whenever you need. You will especially enjoy having the exterior storage compartment to hold onto your large totes, golf clubs, or coolers. Take one of these 96" wide-body XLR Micro Boost toy haulers by Forest River RV with you on your next expedition and travel worry free thanks to the enclosed tanks. The entire Boost lineup can fit most of today's favorite toys, including side-by-sides, four wheelers, and motorcycles, and with the optional 20 gallon external fuel cell with pump, you will be able to enjoy riding those toys all weekend long. Also, the 20,000 BTU furnace and 13,500 BTU air conditioner will be helpful for staying cool during the long, hot summers and warm during the crisp, cool fall.